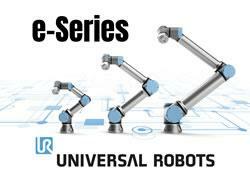 Universal Robots is a result of many years of intensive research in robotics. The product portfolio includes the UR5 and UR10 models that handle payloads of up to 11.3 lbs. and 22.6 lbs. respectively. The six-axis robot arms weigh as little as 40 lbs. with reach capabilities of up to 51 inches. Repeatability of +/- .004" allows quick precision handling of even microscopically small parts. After initial risk assessment, the collaborative Universal Robots can operate alongside human operators without cumbersome and expensive safety guarding. This makes it simple and easy to move the light-weight robot around the production, addressing the needs of agile manufacturing even within small- and medium sized companies regarding automation as costly and complex. If the robots come into contact with an employee, the built-in force control limits the forces at contact, adhering to the current safety requirements on force and torque limitations. Intuitively programmed by non-technical users, the robot arms go from box to operation in less than an hour, and typically pay for themselves within 195 days. Since the first UR robot entered the market in 2009, the company has seen substantial growth with the robotic arms now being sold in more than 50 countries worldwide.